Are you planning on sending your kid into space? Then he'd better have an outfit that's ready for some adventure! 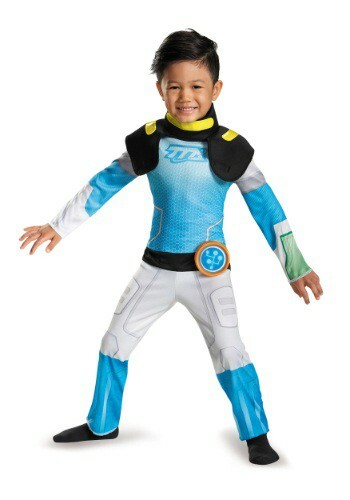 This Miles from Tomorrowland Deluxe Toddler Costume gives your kid the look from the Disney XD show, so your child will be ready to blast off. Of course, since we don't really have the technology to send him into space just yet, he'll have to pretend that the family car is his rocket ship! Has your child been saying some strange words lately, like, "Blastastic!" or, "Let's Rocket!" No, they haven't been visited by hip outer space aliens... they've just been watching the hit Disney Junior show, Miles from Tomorrowland! It's a great way to introduce young minds to science fiction and science fact both. If they're ready for adventures in space with robot ostriches and the like, then our Toddler Miles from Tomorrowland costume is just the thing. Who knows, maybe they'll end up working for the T.T.A. someday!